Casco Bay Estuary Partnership, the Maine Department of Environmental Protection and Friends of Casco Bay collaborated on a project to survey Casco Bay’s eelgrass coverage during the summer of 2013. The study compared new aerial photos taken at low tide with data from 1993 and 2001. The 2013 eelgrass coverage data shows huge losses, particularly in Maquoit and Middle Bays. Hundreds of acres of intertidal and subtidal eelgrass beds are gone. Though eelgrass is sensitive to water quality conditions, anecdotal evidence suggests that the decline could be related to the increase in invasive green crabs. Casco Bay Estuary Partnership has convened a group of experts to develop coordinated eelgrass monitoring and research efforts in 2014. 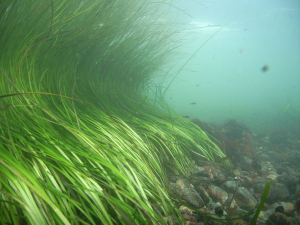 Eelgrass beds provide food and cover for many marine animals, including commercially important fisheries.